In a new study, Transparency Market Research (TMR) revealed the fragmented vendor landscape of the global thrombin market, with a dispersed presence of several players across various nations. 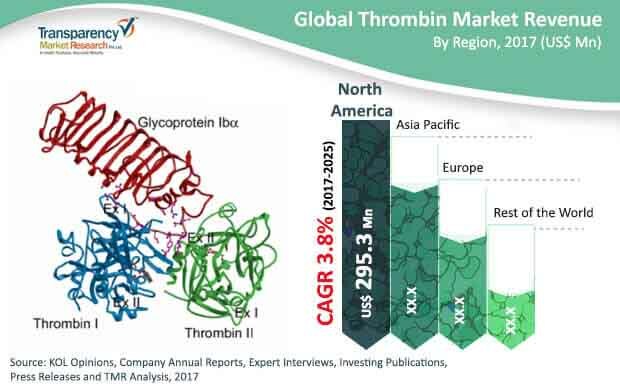 The study has identified companies such as Johnson & Johnson Services Inc., Pfizer Inc., and Mallinckrodt Pharmaceuticals as dominant players within the global thrombin market. Other prominent players operating in the market include Shanghai RAAS blood products co., Ltd., Japan Blood Products Organization, and Mochida Pharmaceutical Co., Ltd. These companies have found a stronghold in Asia Pacific. According to TMR, the global thrombin market is likely to reach US$690.1 mn by the end of 2025, as compared to US$496.1 mn in 2016. Between 2017 and 2025, the global thrombin market is likely to expand at a steady 3.8%. Holding nearly 57.5% of the global thrombin market, North America emerged dominant in 2016. In North America, the US emerged as a highly lucrative market, exhibiting a rather high adoption of hemostatic thrombin products influenced by the high healthcare spending included in overall national budget, easy access to advanced technologies, and high awareness among consumers. Among end users, the hospitals segment is likely to contribute the highest revenue to the global market. According to the World Health Organization (WHO), road traffic accidents account for around 1.25 million deaths globally every year. Globally, hemorrhage or excessive bleeding is responsible for over one third of pre-hospital deaths and around 40% of deaths within the first 24 hours of trauma or onset of bleeding. Rise in number of surgical cases globally is expected to drive thrombin market. The patient pool with different chronic diseases is also growing rapidly across the world. This is likely to increase the number of surgical procedures, consequently propelling the thrombin based hemostasis products market in the near future. Preoperative hemostasis is vital and required for effective management of blending during invasive and other operative procedures which involve the use of blood products such as thrombin-based hemostats and other hemostatic agents to enhance patient’s natural blood clotting ability. Adoption of these thrombin-based hemostats for effective control of bleeding during surgeries in countries such as the U.S. is likely to fuel the growth of the thrombin market during the forecast period. Thrombin is used in various diagnostic procedures such as coagulation assays, defibrination of blood plasma, and clotting factor tests. Thrombin is also used in research and development of fusion of recombinant proteins, medical, and biochemical research applications. Rising use of thrombin in diagnostic tools is anticipated to support growth of global thrombin market and in addition will create new opportunities in the near future. High cost as compared to substitute and conventional hemostats is likely to hamper the growth of the global thrombin market. High cost of standalone thrombin based hemostats limits adoption of thrombin therapy in regions such as the U.S., Asia Pacific, and Europe. Thrombin immunogenicity has been observed in patients in the U.S. and has become a challenge where all three (bovine, human, and recombinant) thrombin available in the market. Therefore, postoperative complications is a major factor hampering the growth of the global thrombin market. A major challenge faced by protein drug substances and peptide drug product manufacturers is absence of uniform and harmonized set of guidelines to define the level of impurities permissible in peptide therapeutics.